Corey Grandfield with the SVRSS Varsity Hockey Team receiving a grant for hockey jerseys. Submitted Story | The Community Foundation of Swan Valley (CFSV) held their annual granting night on December 7, 2017. 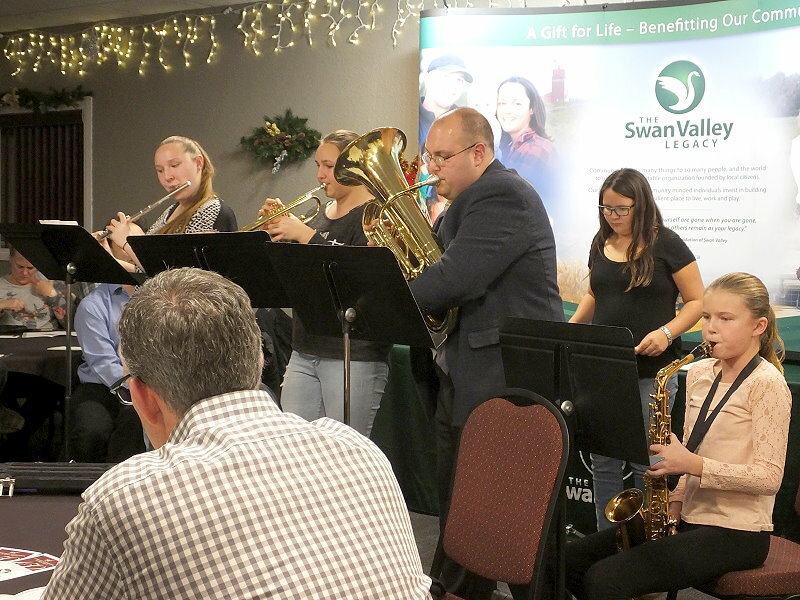 “We are here tonight to harvest the fruits of philanthropy in the Swan River Valley,” said CFSV Board Chair Lorne Henkelman. Since its inception in 2005, the CFSV has reached over $2.2 million in endowment funds, providing a never-ending source of income for the community. The original donations remain untouched and the interest earned is used to support local charities. In 2017, the CFSV granted a total of $80,771 with $49,750 going toward general granting, $17,121 to donor advised/designated grants and $13,900 in scholarships. As each group came forward to receive their grant, they shared how the grant money would be used for their organization. The Band Booster Club took a hands on approach and treated the crowd to some Christmas music. 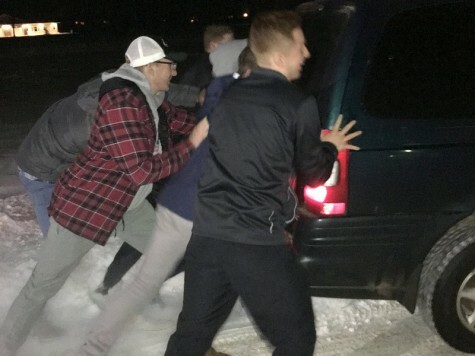 At the close of the evening, the SVRSS Varsity Hockey Team payed the spirit of giving forward by helping push out someone stuck in the parking lot. During this year’s 24-Hour Giving Challenge, an additional $8,750 was donated to the CFSV which was stretched to a total of $12,250 with contributions from The Winnipeg Foundation and Government of Manitoba. The CFSV thanks the donors who make these grants possible and encourages others to consider a donation to the CFSV in celebration of birthdays, anniversaries and other special occasions, as a lasting tribute in memory of a loved one, or as part of your will. There is also still time to be a part of the Celebrate Canada 150 Fund – a unique opportunity to create a lasting legacy and celebrate Canada’s 150th anniversary through a donation(s) totaling $1000, by December 31, 2017.